Join CPI in supporting Mayor Filner’s call for an end to poverty wages at downtown hotels. Use this form and CPI will send your letter to KPBS, San Diego City Beat, Voice of San Diego, San Diego Free Press and the UNION Tribune. San Diego’s hotel owners are threatening to sue the city to get $1 billion over the next four decades, but many don’t pay their employees enough to live on. Tourism is an $8 billion industry in San Diego, yet it pays a median of $24,400 a year for fulltime work. [Details available in our Poverty Report]. Hotels are a big part of the tourism industry, which pays the lowest wages, on average, of all San Diego’s major industries. That’s part of the reason one in three families in the county lives in economic hardship. Many hotels often don’t offer healthcare for employees, or make it unaffordable. At Doubletree San Diego, housekeepers make only $8 an hour and have to pay $400 a month for family healthcare. 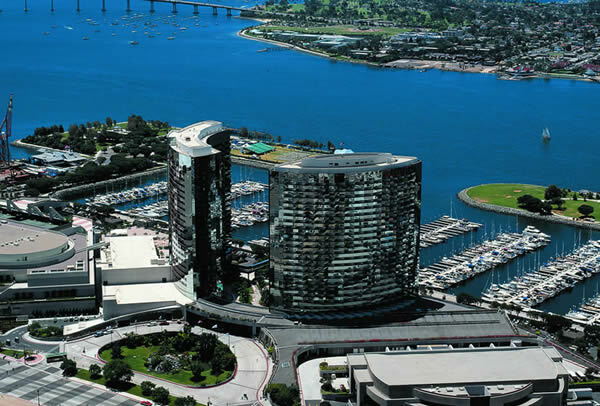 There’s no excuse for such poverty jobs: the nearby Hilton San Diego Bayfront pays $15.50 an hour and provides full family healthcare for only $50 a month. Low-wage jobs without healthcare coverage depress the spending power of the community and raise costs for taxpayers as workers must depend on public aid programs. Hotels do well in San Diego. They need to do well by San Diego. If they expect to receive public funds, it’s only fair that hotel owners act responsibly and provide good-paying local jobs. Please don’t delay or count on others to speak up. The hoteliers are pulling out the stops in their efforts to avoid paying decent wages. Let your voice be heard!